You can transfer American Express Membership rewards points to British Airways at a 20% bonus, through December 31, 2013. That means that you will get 1.2 British Airways Avios points for every 1 Membership Rewards point that you transfer to British Airways. Membership Rewards has had better transfer bonuses ranging from 35% earlier this year to 50% last year, for transfers to British Airways. So I wouldn’t transfer points unless you had a use for them. British Airways Avios also has a distance based award chart which makes it a great value to use Avios for short-distance flights, but a bad value (compared to other US frequent flyer programs) to use them for long-distance flights. So, one of the best ways to use Avios points is for short distance flights. For example, it only costs 4,500 Avios for a flight up to 649 miles and 7,500 Avios for a flight up to 1,149 miles. Avios are good for short distance travel within the US. That’s because you can redeem British Airways Avios for low-level award flights on American Airlines. They are also good for travel to South America without fuel surcharges, and are good to fly to Europe if you’re comfortable paying ~$400 each way in fuel surcharges. You can also use British Airways Avios to fly on Air Berlin or Aer Lingus to Europe with no fuel surcharges. American Express is offering a 30% bonus for transferring Membership Rewards points to Virgin Atlantic up to November 30, 2013. This means that you get 1.3 Virgin Atlantic miles for every 1 Membership Rewards point transferred. Virgin Atlantic charges fuel surcharges on their awards, but they charge less for coach awards. This could help to get to the UK especially since Virgin Atlantic may have more than 2 seats available on some flights. 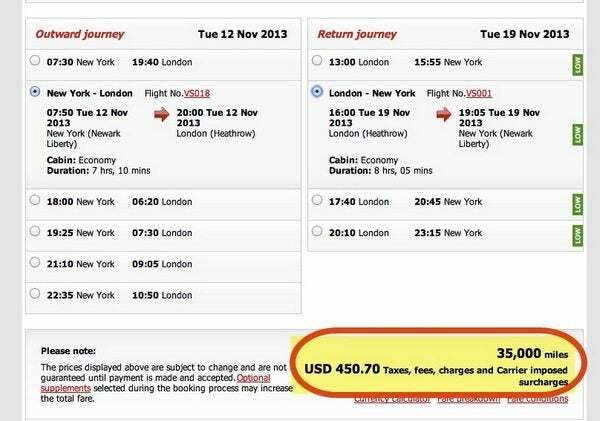 That said, you’re looking at paying $450 + 35,000 Virgin Atlantic miles for a return coach-trip from the US to London. It isn’t a great deal, but could save you some cash over the retail price ($1,000+) for tickets to London. Another good use could be to transfer points from Virgin Atlantic to Hilton hotels in a 1:2 ratio. So you can transfer 1 Membership rewards point to 1.3 Virgin Atlantic miles which would give you 2.6 Hilton hotels points. You have to call Virgin Atlantic at 800-365-9500 to transfer Virgin Atlantic miles to Hilton. Transfers take about 10 to 14 days in my experience. This is much better than the 1:1.5 ratio if you otherwise transferred American Express Membership Rewards to Hilton hotel points. These transfer bonuses could help if you know that you will use British Airways or Virgin Atlantic miles in the near future. But I wouldn’t transfer just because there is a bonus on transfers! @Lauri – Unfortunately, you can’t. @all: Question that bothers me for the last couple of months – so what then will be the best way to use my ~55k MR points (mostly from 50k signup bonus for PRG this January) as it is already time to close the card soon (I definitely don’t want to pay almost $200 in AF)? Highly appreciate any advice! Thanks! @Chris – You can transfer your MR to your wife’s Virgin Atlantic account. @Ilya – Depends on your travel goals. I’d consider British Airways, Aeroplan, Virgin America or Delta. Or you can redeem for ~$550 air travel via the AMEX travel portal. My goal is to get Amex points from my account to my wife’s HHonors account without incurring extra charges. Is it possible to transfer MR to my spouse’s VA account? Or does VA charge me to transfer points to my spouse’s VA account? Or, if that’s not possible, can I transfer VA miles to my spouses Hhonors account? The Virgin Atlantic award chart for Delta flights shows several cities to London roundtrip at 40k Virgin Atlantic miles + taxes. So that’s 31k MR at the moment. If you’re checking delta.com for the award chart, you’re in the wrong place. You should check the award chart of the airline whose miles you’re using.